August 28 - Into the office...oh how familiar! Okay #1 I ate RICE for breakfast! That's a bit much even for a carb-avoire like me. Man I don't know how these people stay thin! The little man who sleeps in our kitchen apparently also makes all our meals and does our laundry which I find very un-nerving. Definitely wont' get used to that! We made it into the office today in a tuk-tuk which was terribly exciting. For those of you who haven't had the joy of experiencing this mode of transport it's basically a vespa with a longer seat in the back and a cover. We only had to drive two blocks but it was certainly exciting. The office is very familiar to me. It looks like like any office at home with modular cubes and big windows. There is even a little poster in my cube stating Ness's 'Values'. Feels like home! Much test scripting to do today so I had better get down to it. Now that all of my North American friends are 10.5 hours behind me I should be too distracted with emails through the day. booo! Have a great one. August 27 - At home in Mumbai! I made it to Mumbai in one piece. The flight was smooth aside from the fact that I was in the last row so was 1) squished due to lack of recline and 2) occasionally treated to the scent of airplane bathroom which was terribly unplesant. Despite all this I managed to sleep a fair bit and read a bit of my new book (the White Masi about a woman who marries a tribesman...it's up for borrowsies when I get back). The movie was 'the Guru' but since I couldn't really see the screen for the subtitles it was a write off. Anyway, we arrived at the shiney Mombai/Bombay airport (everything here has two names a pre independence (British) and post independence (Indian) name) at 5 am and skuttled through immigration, baggage claim and customs. I don't want to stereotype so early but man are Indian people ever PUSHY! I may have to flick someone in the nose before I am done in this country. We found our driver and at the car were swamped by porters who, after helping us lift our bags into the trunk asked us for $$. Ah India. 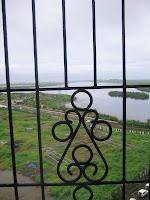 We made our way to Malad, where we'll be living and working, in the dark of the morning. Even though it was black out we still caught a glimpse of the poverty that is set over many of Mumbai's 13 million people. My first impression was that these were not people content with their lives as the majority of folks in SLE and Kenya seemed to be but desolute, warn down and unhappy people. That will take some getting used to. More thoughts on that later. As per what everyone has warned me about the traffic was scary, even at 6:30 in the morning. We made it to 'Whispering Heights' which will be our home and were ushered into a flat where it was obvious a man lived. 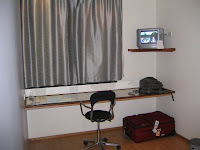 He showed us to our rooms and we were off for some sleep. I was very confused about this place as it was clearly someone's home. I slept for a few hours interrupted by the occasional phone call and doorbell and thought 'my we are popular people'. I got up this morning and took a cold shower (I forgot that I had to turn the hot water on again. Instant hot water is something I definitely tak e for granted at home.) and headed out to the living room. I was greeted by our friend and told we had to change apartments. It all made sense to me now! So I left Conor sleeping and headed to 1108 in tower B. This place is a nicely/corporately decorated two bedroom/two bathroom flat that I assume will be my home for the next nearly 6 weeks. It's nice and the view is of what looks like a river or jutty. The sad part is that it appears that there is a lot of rubbish floating near the shore. I'll have to check it out. 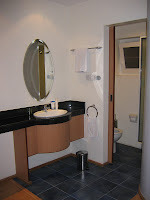 A quick photo is posted. This area looks a lot like harbourfront in Toronto down near the kayak rental place (for those of you who ever visited me when I lived down there) and I think I saw a 'Pizza Hut' sign from the other window. I'll bet Conor is ready for some US Chain food as he was in Africa for nearly 3 months. We'll have to explore today. Perhaps McDonalds is on tap...right after we find the gym in this place. It's later in the day now and since I haven't got connected to the net yet and we've had a little adventure I thought I would add it. Conor and I went for a 'little' walk (which was nearly 2 hours) and sweated our way around the neighbourhood. The people were certainly busy and the traffic amazing. We managed to cross a few intersections alive. We played a rousing game of three-S...Staresies (when someone stares at you you stare back until someone gives up), Sweatsies (I am not going to describe the state of my clothes when we got home but it was like walking around in a sauna) and Swearsies (I'll let you figure that one out but it involves angry bus and tuk-tuk drivers). Glad to be back at 'home' and getting into work for the evening. We got ourselves a pop for a meer $0.50 which will save us plenty of money for our dinner! Conor and I are here for a week then more of the team (Marte, Nicki, Khalila, Paulina and Hans) arrive on Sunday and will be staying in the same building (we think) and then Susan and Nana arrive the week after.Most people leave on September 22nd then I stay until October 2nd to finish some testing up. I think experiencing this country with the whole team will be fabulous and we even have a trip to the Taj planed (smile!). I can't believe it either. Tomorrow is my last 'trip to a new place of work' for my ADP journey. We head out to Mumbai at 8pm tomorrow. I am super excited. It is interesting that I have become much less nervous about changing places. Heading to Woking was scary (away from home for 9 months...yikes), heading to SLE is terrifying (what the heck is Africa really like? 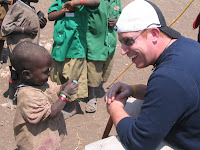 why do people keep touching my arm in fear when I say I am going to Freetown?) 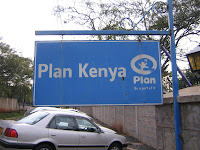 and coming to Nairobi by myself was jittery but more exciting than scary. For India I am just excited. Perhaps I am starting to look forward to the end of this crazy assignment. I was saying to someone yesterday that I am VERY excited to eventually be home (I know, stay in the moment and enjoy...trust me I am) and I think that by December my head may explode with excitement! Anyway, my last week in Nairobi was great. 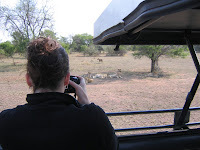 Here are a few more safari photos (thanks Martha) http://www.facebook.com/album.php?aid=46865&l=40b9c&id=713560547and I promise a write up asap. I am swamped with work in preparation for our big test phase coming up in two weeks so have to dedicate myself to that for a bit but I'll get to it, I promise. Wednesday night I returned to Carnivore (the famous Nairobi all-you-can-eat hotspot) for the second time this week with my team. I again enjoyed the Ostritch meat balls and we managed to dance the night away in the club next door until 2am. Man I had a hard time getting up the next morning. Not as spry as I used to be. Today Conor, Khalila and I are off for one last market run in the sunshine. The weather here has significantly improved since I got back from vacation and I even got a bit of a burn on my arms during a meeting with my DBA in the garden yesterday. BTW if there is anyone out there with .NET skills who wants to move to Tanzania (which is stellar) let me know and I'll hook you up with Hans. Okay, it's saturday and I have tonnes of work to get through before we leave tomorrow so must go. Have a fabulous weekend! August 22 - Back from Safari! I have to say that my holiday was definitely the best ever. It was amazing to be out there with all the animals and some of my best friends. What an adventure, what a break, what memories! 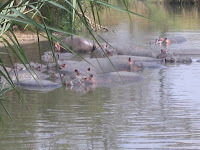 Hippos...almost too close for comfort. I have posted my photos on Picasa (http://picasaweb.google.com/trainitl/TinaSSafariPhotos) and some on Facebook but wait for the ones we took with Jay's new SLR camera...amazing. 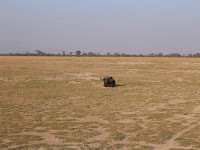 - a massive crater full of animals...we even saw an elephant from the bathroom! 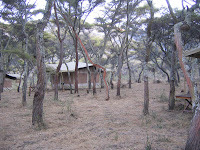 We visited Amboseli, Masi Mara, Lake Navisha and Mombassa in Kenya and Ngorogo Crater and the Serengeti Plains in Tanzania. My passport is really shaping up. Thanks to Jay, Sarena, Martha, Sadie and Kyle for dragging their butts all the way here. It was super nice to have old and new friends around. I'll post more stories later but wanted to let you all know I was alive and kicking and post a couple of photos. Tomorrow is my last day in the Nairobi office which is sad. Sunday we are off to Mumbai so that's pretty exciting! August 8 - Off I go! 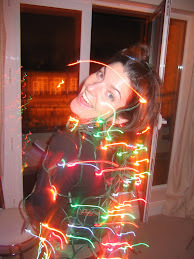 Just a note to let you know that, as of 5:30am tomorrow, I am on holiday! Off to safari for me including so much excitement. Hang on tight for loads of photos and stories! 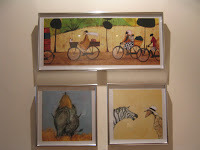 I am taking orders for safari animals but you'd better get them in soon cause I am off to bed. I'm back on the 21st. If I get to a computer during the vacay I may post but I have to say...computers will be repulsive for me so don't expect much. Sorry! August 6 - Weekend fun! This weekend was a bit of an adventure. I wanted to keep it low-key as I had 1) a lot of work to do and 2) was pretty tired because due to construction across the street I hadn't got much sleep lately. 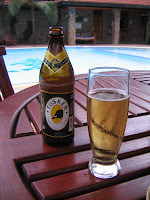 Friday night I went to the next door hotel for some dinner and my first Tusker beer. It was deliscious! There's something about sitting next to a pool eating by candle-light. After a satisfying meal I headed off to bed. I met up with Khalila at 1pm and we went off for a little shopping and a tour. 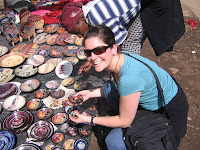 We drove around and went to the market in downtown Nairobi. It was a lovely day and I think we both spent more money than we expected. I got some jewelry and gifts including something for my dad for his birthday. I am not sure who spent more me or Khalila. :-) Here are some photos of us in action! We then toured all the malls in the area and had some lunch. I met a local hairdresser who has offered to cut my locks (and boy do they need cutting) and then we rented movies. We spent the evening eating snacks and watching movies. Perfect! Conor returned on Saturday so we went for dinner on Sunday and he showed me some of his safari pics. To say I am excited about my holiday would be the understatement of the century. I can't wait to see all the animals and to relax for a few days! Horray! August 3 - I left the hotel!!!!! Well folks...Khalila managed to drag me out last night for dinner and a movie. It was fabulous to get out of the office/hotel! We went to dinner at a very romantic, candle-lit and yummy restaurant called Talisman which is on the outskirts of Nairobi near the Bixen house (which I'll visit next Thursday). The restaurant had a fabulous courtyard and amazing food! Then we went to see a flick (Die Hard 4..there wasn't much choice) at the mall. I stopped into the grocery store to get some water (it's $3 CAD for a litre at the hotel) and man was I shocked. It was like a giant Walmart with everything from wine to exercise equipment. Very different from Freetown! 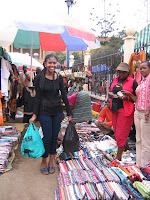 The mall (Nakumatt Junction) has a load of little shops, the supermarket, a Java house (http://nairobijavahouse.com/) and a bookstore (like a chapters). Very North American. We drove around a bit too. One of the huge differences I see is the vegitation. The trees here are massive and beautiful. I promise photos soon. This city is busstling. I can't wait to explore on the weekend. Must get back to work. Test Scripts await. The good news is that I have finished 3000 Test conditions....from those of you who that makes sense to I want to hear a wooohooo! All you Canadians enjoy your long weekend and BIG GOOD LUCK to Elena and Josh who are tying the knot this weekend. Everyone enjoy the wedding and take a ridiculous amount of pics! 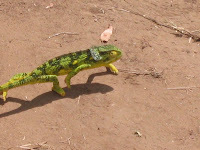 Just wanted to post a few more pictures of 'life in Nairobi'. It's sunny today so I may go for a little walk at lunch and take a few more snaps. Still need to get a photo of the Plan sign for my collection to. Here's some snaps of my room. It's pretty big and fancy compared to Freetown but there is a significant lack of turkeys, deer and lizards! And lunch yesterday. They have some local girls come in with food. I just went to the kitchen (the land of deliscious coffee and tea...man is the tea here ever good!) and smiled and wham...amazing food in my hand. Don't ask me what it is...greens, stewed bananas (which I actually liked!) 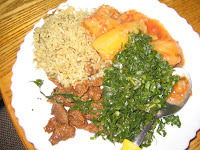 herbed rice and some sort of meat...yum! Oh one more note. My new favourite differentiator between Freetown and Nairobi has to do with scaffolding...Sierra Leone used long poles of wood for scaffold on new buildings and here they have normal metal scaffold. I know sort of a silly observation but I think it shows the difference in development very simply. p.s. If one more person comes close to ruining the new Harry Potter book for me I will SNAP! I am waiting to buy a copy in India (too much work now to be distracted and let's face it...an indian copy will be cool!) so DON'T TELL! I did see the last movie however which was fabulous!